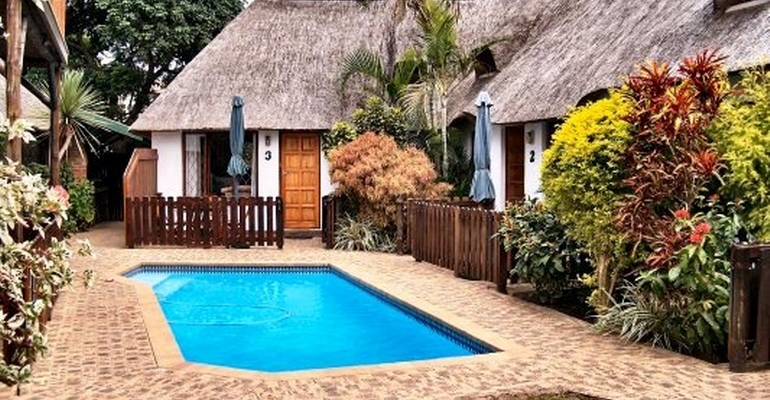 Emerald Cove is a lovely thatched complex that consists of 7 self catering chalets ranging from 2 sleeper units to a 6 sleeper unit. The establishment is only a short walk under the milkwood trees to get to the popular bathing beach at St Michaels and is also within walking distance of the Shelly Beach shopping mall. There are 4 x two bedroom chalets with second upstairs loft bedroom (sleeps 4 or 5). There are 2 one bedroom chalets with a double bed in the main en suite and sleeper couch in the lounge. (sleeps 2 or 3). There is one 3 bedroom 2 bathroom chalet which sleeps 6. All the units are fully equipped and have their own patio, comfortable lounge with TV and a DSTV connection (Bring your decoder). There is a sparkling swimming pool at the centre of the accommodation, where you can enjoy a braai while cooling off in the pool. 7 Self Catering Chalets from 2 sleepers to a 6 sleeper. Prices are seasonal and start from R600 / unit.